Jon 'maddog' Hall (Amherst, NH) is Executive Director of Linux International. Mr. Hall is a world-renowned Linux Evangelist and the author of the first two editions of Linux For Dummies as well as other For Dummies books on SuSE and TurboLinux. Paul G. Sery (Albuquerque, NM) works in the Special Projects Group of the Sandia National Laboratories. He assists in the operation and management of the Computer Science Research Institute Network. He is the author of the Red Hat Linux Network Toolkit and the co-author of Red Hat Linux Internet Server, TurboLinux For Dummies, and Red Hat Linux in Small Business. Part I: Installing Red Hat Linux. Chapter 1: And in the Opposite Corner . . . a Penguin? Chapter 2: Getting Ready for Red Hat Linux. Chapter 3: Ready, Set, Install! 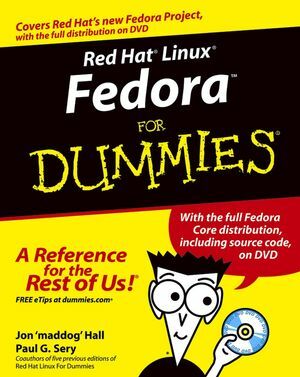 Chapter 4: Getting Red Hat Linux. Chapter 5: Dial-Up Modems Still Get the Job Done. Chapter 7: Connect Locally, Communicate Globally: Connecting to a LAN. Chapter 8: Only You Can Prevent Network Break-Ins. Part III: Linux, Huh! What Is It Good For? Absolutely Everything! Chapter 10: Gnowing More Applications. Chapter 11: Surfin’ the Net and Groovin’ to Tunes. Chapter 12: Live from the Net. Chapter 13: Going to the Office. Chapter 14: Days of Wine and Applications. Part IV: Revenge of the Nerds. Chapter 15: Building Your Own, Private Network. Chapter 16: Creating Basic Linux Network Services. Chapter 17: Securing Your Future. Chapter 18: Bringing In the Red Hat Linux Repair Man. Chapter 19: Building a Streaming Audio Server. Chapter 20: Ten Problem Areas and Solutions. Chapter 21: Ten Security Vulnerabilities. Appendix A: Red Hat Linux Administration Utilities. Appendix B: Discovering Your Hardware. Appendix C: Filing Your Life Away. Appendix D: Becoming a Suit: Managing the Red Hat Linux File System. Appendix E: Revving Up RPM. Appendix F: About the DVD-ROM. Here you will find links to all the web resources in the book, organized by chapter. http://www.powerquest.com - We apologize, however, this url was working at the time of publication but the owner of the site has since stop publishing this page. You can visit the latest Fedora resource links here. https://listman.redhat.com/mailmain/listinfo - We apologize, however, this url was working at the time of publication but the owner of the site has since stop publishing this page. You can visit the latest Fedora resource links here.